You may be asking yourself how the color of the sky applies to Domestic Abuse/Violence. Or – you may know exactly why I bring this up. This example about color identifies a problem that exists within the context of abuse: the abuser defines his or her experience as reality and imposes that definition on his or her victim. It looks something like this: “I am going to insist that you make sure I eat and that the children are ready for our Saturday outing as your first priority on Saturday morning. If you complain or want to take time to sit down and eat instead of making the necessary preparations, then you are selfish. If I have to wait for you to get yourself ready for our outing after you have helped everyone else satisfy their hunger and get ready for the day, then you are too slow.” I hope from this example you can see that the person receiving this message is probably neither selfish nor too slow. The sender of the message is being abusive by creating definitions focused on ensuring that the abuser’s needs are met to the exclusion of anything else. 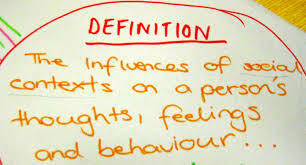 And because the nature of abuse often includes various levels of confusion, isolation and/or fear, the victim does not usually have the power to evaluate the situation and put her or his finger on the problem: definitions. Within the context of abuse, there are many definitions imposed upon victims. Abusers often define reality (e.g. the color of the sky), what love looks like, what love does, what a person’s priorities should be, how a person should interact with others and what kind of a person someone is based upon the abuser’s perception, needs and judgement. Does your abuser define your reality? It is my observation that aside from factors such as finances and the lack of extended family supports, the unresolved emotional and mental confusions that are a result of the abuser’s definition of reality are the primary problem influencing the reason victims return to their abusers. A victim successfully escapes physically and then has to wrestle with the mental and emotional aftereffects of the act of leaving. In most cases, the abuser has set the stage and prepared the victim so that leaving causes a tremendous amount of fear and anxiety based on the “realities” created by the abuser during the relationship. In fact, the “realities” are not realities at all. Most of the time, they are lies. Lies that have to be examined if the victim seeks to successfully eliminate abuse and violence.